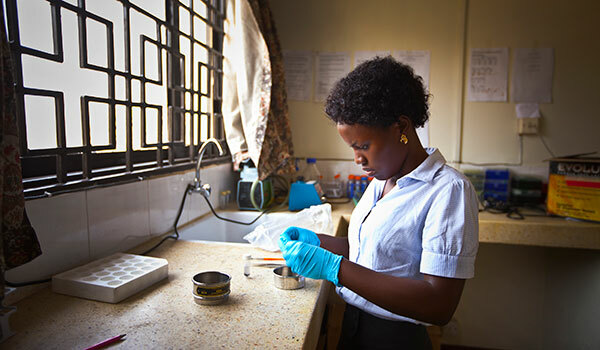 At the Carter Center's field office in Kampala, the capital city of Uganda, a busy scientific laboratory is devoted to a single cause: the surveillance, and ultimate elimination, of river blindness. For the past five years, lab staff have performed two exacting processes hundreds of thousands of times. One is the analysis of blood samples using the OV-16 antigen to detect the presence of onchocerciasis microfilaria, the pre-larval-stage parasitic worms that can infect the body. The other is the testing of black flies and "skin snips" of human tissue to learn whether they contain the parasite's DNA. 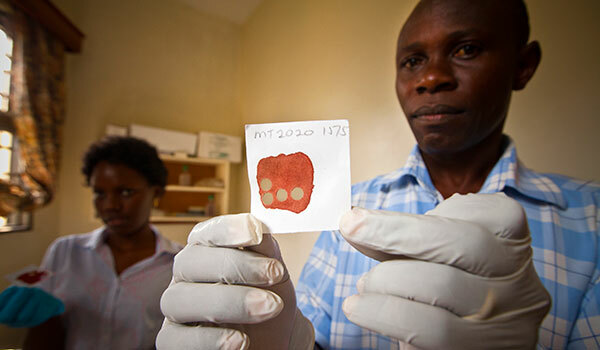 David Oguttu, a Uganda Ministry of Health staff member, oversees the onchocerciasis lab in Kampala. David holds a child's blood sample which he is testing for exposure to onchocerciasis microfilaria, which cause river blindness. 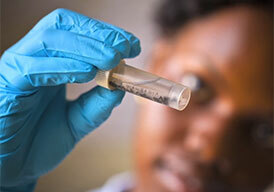 Lab technician Christine Nahabwe prepares to test a blood sample. It is estimated that this lab has performed more OV-16 analysis than any other in the world. Black flies are collected by community members who use themselves as bait. 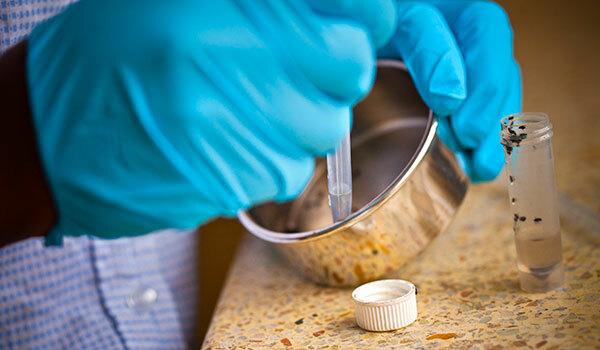 Each sample is carefully labeled with the date and place of collection so the lab can track transmission. Volunteers and health workers in Uganda's 32 endemic districts collect these samples from community residents, pricking thousands of "blood spots" from children under age 10 and snipping skin from adults. Community members also gather fly samples the only way the pests can be caught: by using themselves as human bait, sitting beside fast-flowing waters and trapping the unsuspecting flies in bottles when they land to bite the skin. 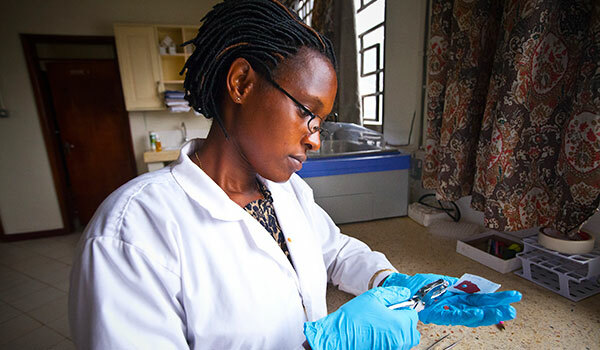 Established in 2007 by The Carter Center and the Ministry of Health Vector Control Division, the lab tests about 17,000 blood samples each year. It is estimated that this lab has performed more OV-16 analysis than any other in the world. Overseeing this Olympic effort is senior lab technician, David Oguttu. A native of Uganda's Busia district, Oguttu holds a bachelor's degree in biomedical lab technology from Makerere University's School of Entomology and Parasitology. Oguttu grew up seeing people in his village suffering and dying from another parasitic disease, schistosomiasis, and was moved to choose a career in public health. In 2007, with sponsorship from The Carter Center, he was selected to travel to the United States for a five-week training program in practical molecular epidemiology, studying with Thomas Unnasch of the University of Alabama-Birmingham. Oguttu learned lab techniques including OV-16 testing and DNA analysis using a special machine that creates a polymerase chain reaction (PCR). When he returned, he trained eight other technicians to conduct these procedures. "I enjoy lab work," Oguttu said. "When we started, the morbidity level was very high. Now we have reached all affected communities, conducting screenings and giving health education. Every mother is bringing her children. Everybody wants our services. This is a great achievement." Oguttu and the lab staff are seeing fewer and fewer infected samples, as river blindness transmission has been halted in several areas of the country. But it's estimated that more than a million people are still affected and another 2 million remain at risk. According to Oguttu, the statistical data they are producing in the lab are more important than ever as the country strives for elimination by 2020. "We are the only lab doing this in Uganda," he said. "These are neglected tropical diseases. No one cares about them. We are the only department in Uganda going out into the communities to bring these services to the people. Sincerely, this is great work, and I am very grateful to be doing it." As a world leader in disease eradication and elimination, The Carter Center now has set the goal of eliminating river blindness in all of the countries where we work against it. As such, the Center's River Blindness Program recently was renamed the River Blindness Elimination Program.